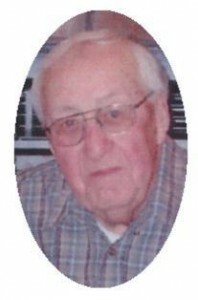 Donald J. Ziehr, 90, of Hollow Circle, West Bend died Friday, August 21, 2009 at his residence. He was born February 24, 1919 in Dorchester, Wisconsin to Paul J. and Linda A. Anderson Ziehr. He graduated from Port Washington High School in 1936. He was a first Lieutenant in the United States Army during World War Two. On August 4, 1945 he married Helen Paulus of Fredonia, Wisconsin at St. Rose of Lima Catholic Church in Fredonia. He is survived by his wife Helen of West Bend, children Richard (Joan) Ziehr of Madison, Patricia (Patrick) Niles of Grafton and Frances (Michael) Vandre of Jefferson. Further survived by 10 grandchildren, 5 great great grandchildren, sister Beverly (Norbert) Klein of West Bend, other relatives and friends. Preceded in death by a son, Michael, 2 sisters Virginia Mours and Shirley Lange and 3 brothers Claytus, Gerald and Delton Ziehr. Reverend Nathan Reesman will celebrate Mass of Christian Burial 4 pm Monday, August 24, 2009 at St. Frances Cabrini Catholic Church in West Bend, Wisconsin. Interment St. Rose of Lima Catholic Cemetery, Fredonia. Visitation 2 – 3:50 pm Monday, August 24, 2009 AT CHRUCH with a 3:50 pm American Legion walkthrough. Memorials to the American Heart Association appreciated.